The Subaru is only the twenty second most purchased vehicle in America, but with the widespread popularity of the Outback and a full line that goes from the sensible Impreza to the headturning BRZ, Subaru has earned its place in the contemporary pantheon of well-known driving machines. Sporting an identity split somewhere between family vehicle and off road adventurer, it might be best to describe the average Subaru owner as an urban explorer who’s ready for anything. At Menke’s, we want to keep you ready. Like all Japanese vehicles, the Subaru requires a little bit extra when it comes to diagnostics and part replacements. That’s why Menke’s comes fully equipped with the cutting edge technology to find and fix issues fast. 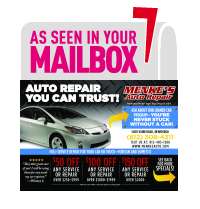 Our staff is fully trained and ASE certified to work on Subarus, and with regular training on the newest in Japanese diagnostic equipment, you can trust Menke’s to keep your car in factory new condition. Special equipment is just one reason why we were named 2014 Facility of the Year and the “Top Shop” in the USA out of 165,000 garages surveyed. The rest comes down to superior customer service, fast turnaround times, and dependable repairs. At Menke’s, customer satisfaction isn’t just a promise, it’s a passion. That’s why we received an Angie’s List Gold Award for Super Service. It’s also why we’re the only AAA Approved Repair and Service facility in Southern Indiana. Our Best Dressed Shop Award? That’s just our way of showing we care. Bring your Subaru into Menke’s and you’ll get a free loaner car while your car is in the shop. Spend some time enjoying our living room like waiting area with full cable television and free wifi. Superior auto service comes down to the details. Find out why we’re leading the way in auto repair.